HMNS is a huge place full of things both big and small. When I used to guide public tours through our exhibit halls, I used to always stress that size does not determine an object’s importance. Sometimes the tiniest artifacts, the most minuscule fossil specimens can change everything we know about their respective fields. But even so, I still appreciate the feeling of being towered over by a giant dinosaur, or awe-struck by massive amethyst crystals projecting from the walls inside our giant geode. Bigger isn’t always better, but it’s still cool. 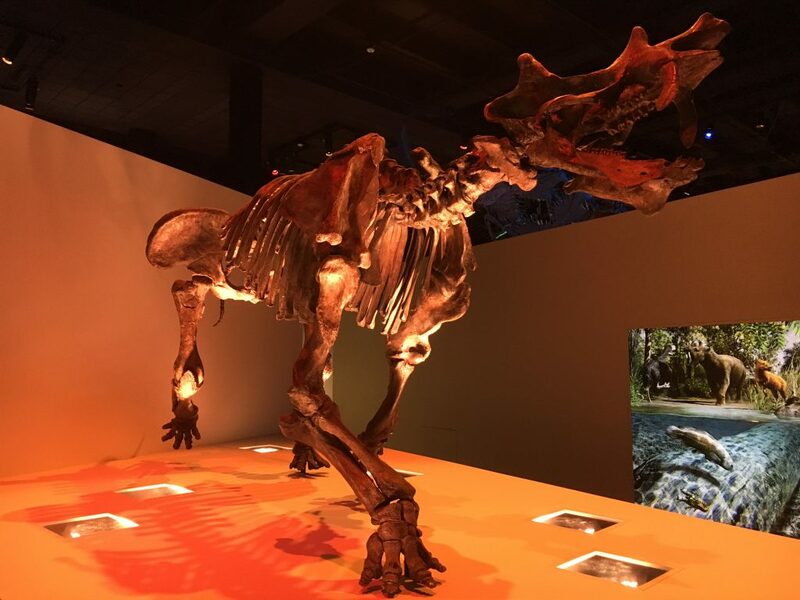 Today I will list five of the biggest objects on display at HMNS. To ensure that all the spots aren’t taken up by dinosaurs (let’s face, they don’t have much competition) I have broken the list into different categories. Our biggest dinosaur is undoubtedly our Diplodocus, affectionately called “Dipsy”. Diplodcus was once regarded as the longest dinosaur to ever walk the Earth. The problem with that title though is that many other species of sauropod (i.e. “longnecks”) do not have skeletons complete enough to determine their actual size. Regardless of that little complication, Diplodocus got up to 90 feet long, which is pretty impressive! Much of Dipsy’s length is made up of her long, whip-like tail. 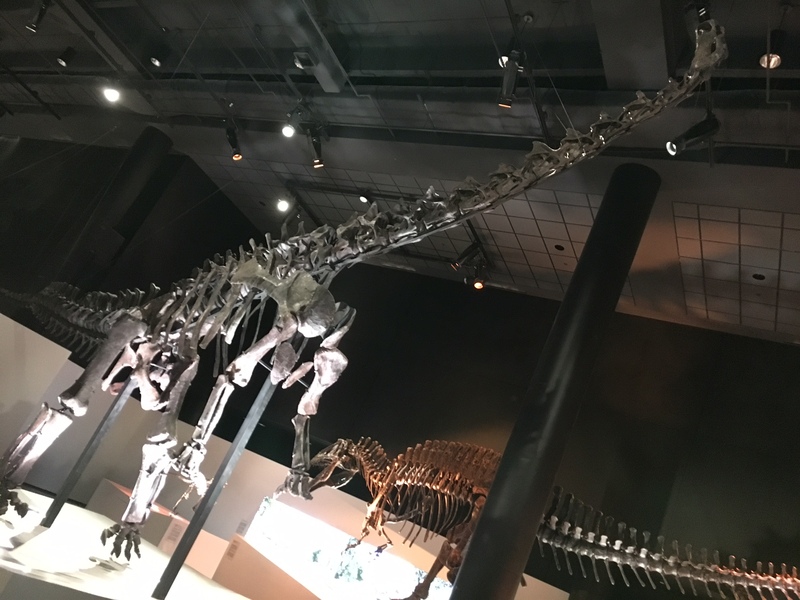 It is believed that Diplodocus could use the lengthy appendage for defense, slapping away predators and possibly even cracking it like a whip! You’ll notice that our Diplodocus is mounted standing up on its hind legs. All sauropods, including Diplodocus, walked on all fours, but some paleontologists believe that their long tails could be used as a counterbalance to stand on their hind legs for short periods, allowing them to lift their long necks and tiny heads to higher parts of trees that hadn’t been stripped of leaves yet. 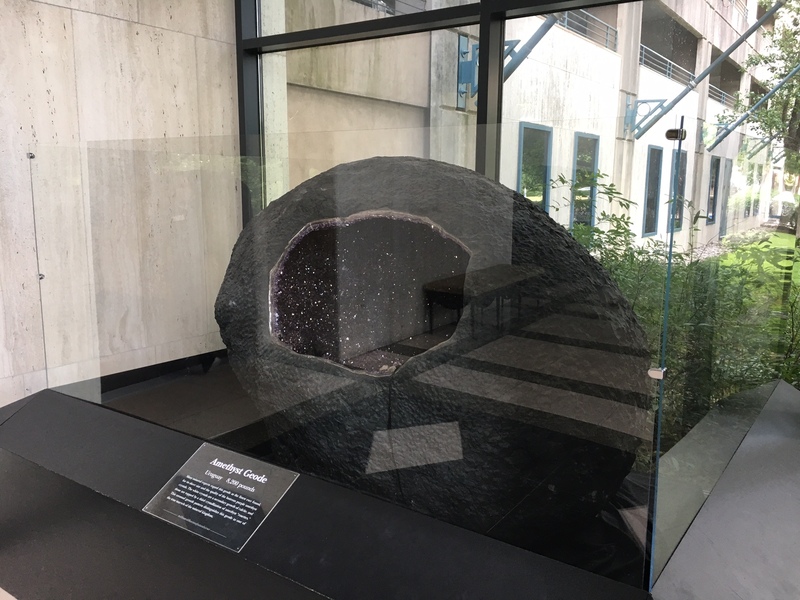 Weighing a whopping 8,200 pounds, our amethyst geode from Uruguay didn’t face much competition for it’s title. Geodes like this one are formed in lava flows. As the molten rock cooled the walls of empty chambers filled with gas hardened into a sort of petrified bubble. Over ensuing millennia, groundwater percolating through the rock layer deposited minerals in the hollow cavity, eventually creating beautiful specimens like the one above, and also the ones for sale in our gift shop (hint… hint…). 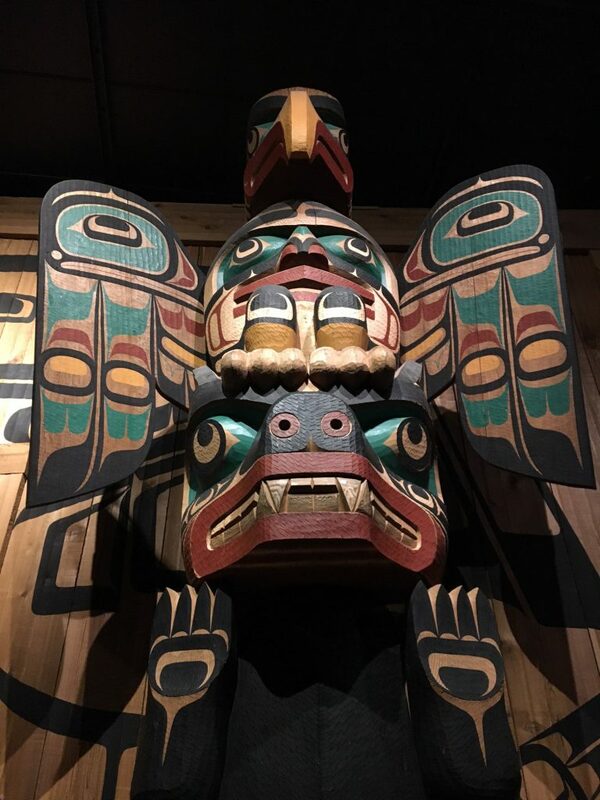 Carved in 1956 by artist Calvin Hunt, a member of the Kwakwaka’wakw people of British Columbia, this house post is topped with a thunderbird, a recurring character in many of the tribes’ traditional stories. House posts (or “Totem Poles”) are used by many culture groups in the Pacific Northwest and act as a sort of combination coat of arms and genealogy map for families living in villages. Traditionally in these societies the extended family, or clan, that you belonged to determined your position within society. Each clan was believed to be protected by a spirit, often in the form of an animal. The carved animals on the poles represent those clans. Sometimes the poles tell stories of interactions between clans, other times they record the family history of one clan. So when most people think “saber-tooth” their mind instantly conjures images of Smilodon, the dreaded saber-tooth cat of the Pleistocene, but Smilodon wasn’t the biggest saber-tooth out there. That title actually belongs to a plant eater! Meet Uintatherium, the super rhino! Although the animal is not closely related to modern rhinos, it was about the same size and did have a similar defense mechanism—similar but better. Uintatherium had six bony protrusions on top of its head, plus two huge saber teeth. The function of all this is uncertain, but many paleontologists believe they were for attracting mates. Males may have competed for the attention of females by locking horns, like modern deer do. At approximately ten feet long, many ask if this coffin belonged to a giant. In reality it belonged to a normal-sized person who may have had a giant ego. Bigger is better, right? The occupant’s name was Ankhemmaat, a priest of the god Herishef. 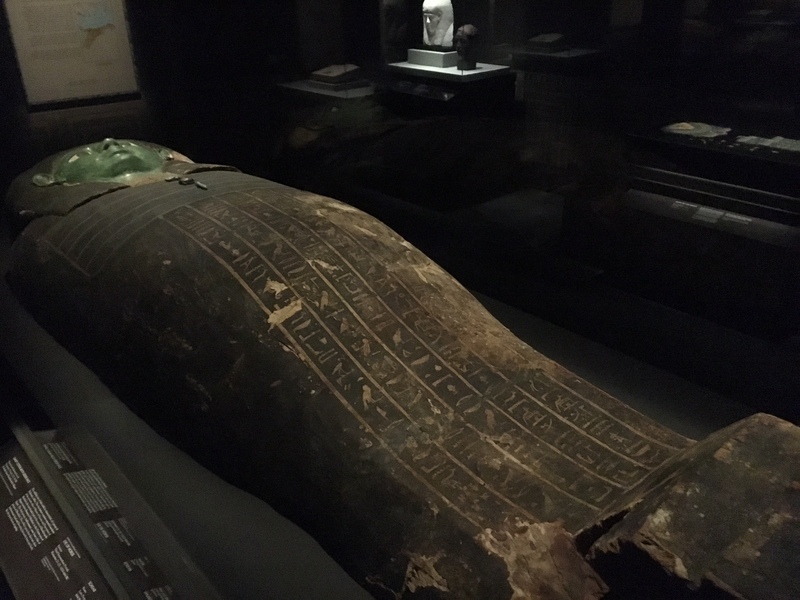 The large size either means that it was originally a layered coffin with an interior lid covered by the one pictured above or it may have been designed to contain ceremonial objects buried inside the coffin, beside the mummy, instead of in the chamber around the coffin. The green face represents Ankhemmaat being reborn in the afterlife, like a plant in the spring.